Designed in-house, the 93-square-metre space in Soho is completed in a taupe colour palette and lit up by massive light tubes running across the ceiling. Eytys in-house design team said that its starting point for the design was the spaces designed by Shiro Kuramata for Issey Miyake in Japan in the early 1980s. "Kuramata was a pioneer in creating playful, yet uncompromisingly minimal designs; many so complex they could only be realized years after his death in 1991," said creative director Max Schiller. "Like that perfect mixtape, the design of Eytys London store was about clashing our favorite periods of architectural design. As we all know, the party playing both Talking Heads and Sean Paul is the best one." 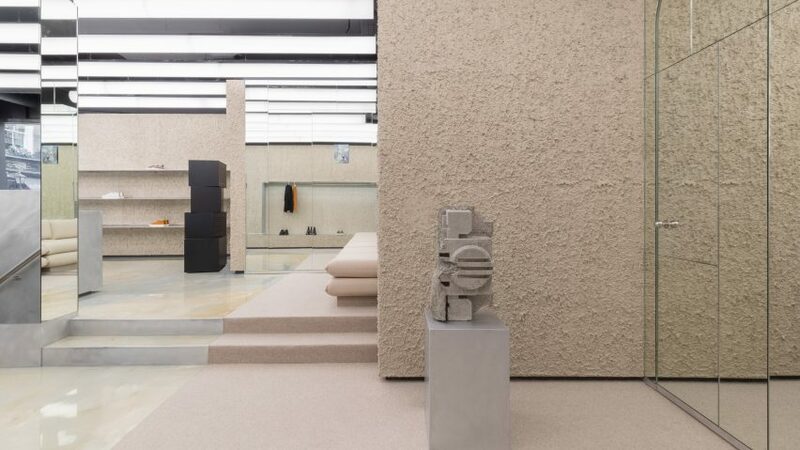 The store's rough brutalist-inspired concrete walls are contrasted by elements in massive aluminum and Italian burl veneer, which the Eytys design team point out is a material combination favored by Austrian postmodernist Hans Hollein. Hollein's work served as another source for the interior design, with a reflective metal palm tree and mirrored walls and doors that house the fitting rooms. The massive light tubes that run across the ceiling are intended to be reminiscent of the facade of Centre Pompidou in Paris. The interior also features pieces of art from Eytys founders Max Schiller and Jonathan Hirschfeld's personal collections. The assortment of work by Swedish progressive female artists includes a concrete sculpture called Logogram 5 by Hilde Retzlaff, as well as a large embossed cow skin parchment from Berlin-based artist Linnea Sjöberg's performance project Salong Flyttkartong. Located on the corner of Brewer Street and Sherwood Street in Soho, the store stocks Eytys's full collections of unisex footwear, jeans and ready-to-wear. The Stockholm-based brand launched with footwear in 2013 and opened its first retail outpost in Stockholm in 2016. The footwear offering has since expanded to include a full jeans collection, which launched in 2017, and a full ready-to-wear collection, which will launch for spring 2019. Last year, Universal Design Studio completed a 343-room luxury hotel housed inside a brutalist former bank headquarters in Stockholm. At the time the architects explained: "Our design is focused on humanising the architecture, bringing a sense of desirability and luxury to a brutalist building not often associated with these traits, turning the hotel into a contemporary version of a metropolitan grand hotel."